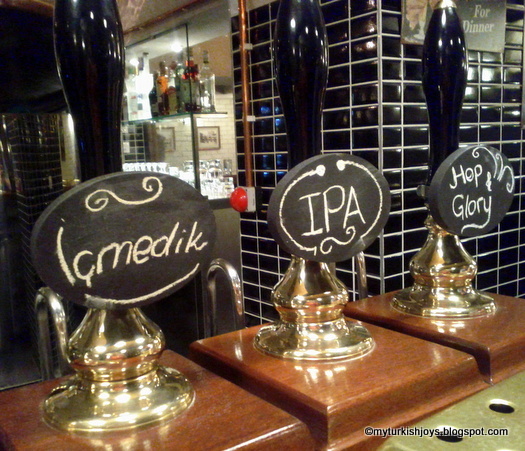 British family serves craft ales in Esentepe neighborhood. IPA. Hoppy beers. Homemade stout. Could it be true? In Istanbul? Yes, a charming British family, who love good beer, finally decided to start brewing and selling their own beer right here in Istanbul. The Bosphorus Brewing Co., nestled in a side street of Esentepe about a 10-minute walk from the Gayrettepe metro station, officially opened last week. A good friend went on Friday night and enthusiastically reported back to us. Hubby and I went on Sunday afternoon. For many of us expats in Istanbul who miss craft ales, the word of this brewery's opening has spread quicker than the time it takes to make a cup of Turkish coffee. Don't get me wrong. Turkey's popular beer, Efes, is an easy-drinking beer, especially on hot summer nights. But we miss the variety of beers you find on the East Coast in the U.S. If you're British, I'm sure you miss a true Enlgish pub as well. The British owners are a family from Doncaster who've lived in Turkey for several years. The father, Philip, told us he used to brew his own beer here at home because he missed a good English pint. His son, Tristan, entertained us at the bar, while his mother was in the kitchen working with a former Turkish airlines flying chef, who's now in charge of the brewery's kitchen. Yesterday, there were five beers on tap, so we tried them all. Each glass costs 10 tl. I preferred the Istanbul Pale Ale (IPA), which comes in a "lady's glass" for women Tristan joked with us. Hubby received his IPA in a more traditional beer mug. I also liked the içmedik ("We didn't drink" in Turkish. But the name sounds funny too.) - "an easy drinking, crisp beer with a delicate balance of fresh apple...finished with the tingle of traditional lager hops" as it is described on the menu. This beer kind of reminded me of a Blue Moon, which I also like. In addition to single pints, you can try a beer sampler tray of the five beers for 10 tl. The pub's menu features true English pub food such as fish and chips, beef sausage and mash, steak in ale and even a lamb curry. On Sundays night, they serve a beef roast dinner with Yorkshire puddings for 45 tl. 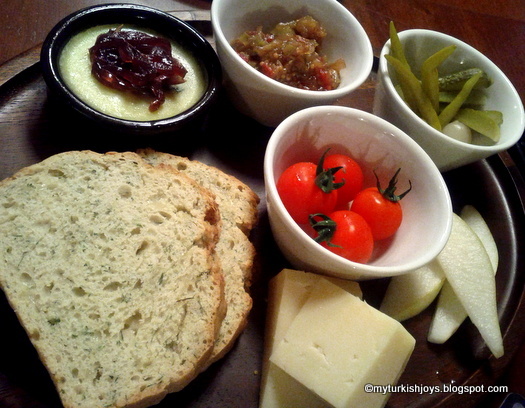 We snacked on the ploughman's platter which featured housemade dill beer bread and an outstanding chicken liver terrine. 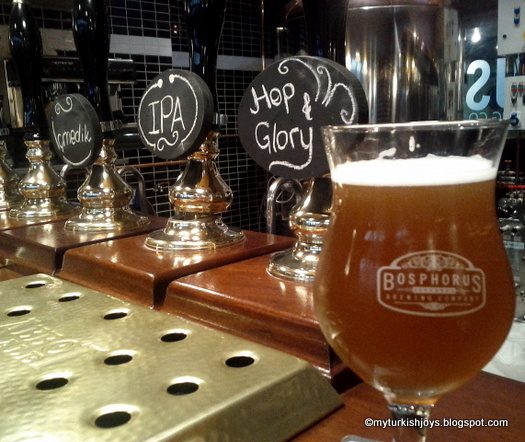 There are several hundred places that serve Turkish food in Istanbul, but not one pub that serves food like the Bosphorus Brewing Co.
As we drank our British craft ales, I had to wonder if we were really in Istanbul. Go tonight. Grab your friends and go this weekend. But go soon! 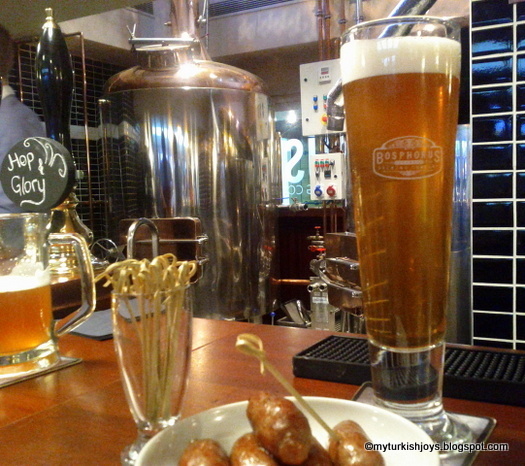 We also noshed on the bar's menu spicy English sausages. Delicious! 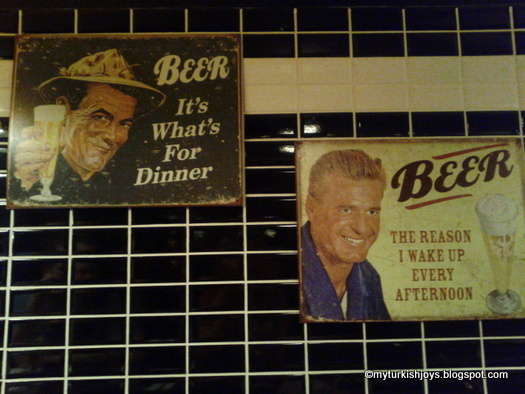 Beer signs at the Bosphorus Brewing Co. in Istanbul. Do they serve it warm? do those english sausages have pork in them? i sure hope so! great name too! @BacktoBodrum, of course you can! Pass along the word. The owners are really friendly people and hope people will discover them in Istanbul. @Barbara, just like you'd find it in an English pub! But I love my IPA! This is wonderful! Definitely adding this to the next-time-I'm-in-Istanbul list. @Deniz, Definitely! I'd be happy to meet you there too next time you are in Istanbul. Great place! We'll be back soon. Ha, already emailed your blog link to my kids. Thanks! i will list it in my facebook page too (you are most welcome to like it too ): www.facebook.com/planeteturquie. As well in my site that is on development www.planetetuurquie.com for french speaking and turkeylanet.info for english speaking. I am planning to make a long trip in turkey , i shall visit all those nice places Joy in istanbul!!! 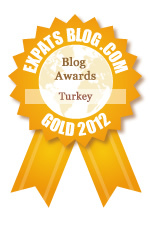 @Planete Turquie, thank you for stopping by my blog. I hope you find some useful info for your upcoming trip. I'll also take a gander at your FB page. Cheers! Hey Joy thanks for such a great review on the pub! From Tristan @ the Bosphorus Brewing Company! @Tristan and @Jill, Happy to spread the word. Thank you! Hubby had a wonderful time last night drinking your beers. Unfortunately, I've caught a bad cold, but hope to get back to your brewery soon. What is this east coast of the US stuff? I am thrilled to be going to the brewery next weekend, but much of it is out nostalgia for my west coast IPA... and my genuine love for beer. Hi Ben, sorry I'm an East Coast girl so I like my Dogfish Head IPAs. :-) Haven't been much to the west coast so I can't compare. I'm sure you'll enjoy the Bosphorus Brew Co. though.